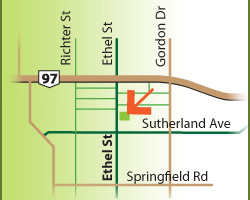 ESTM is located just North of the intersection of Ethel Street and Sutherland Avenue. It is 3 houses from the intersection and there is a large maple tree in the front yard. The clinic has it’s own level entrance from the driveway. If you are coming from the bridge, turn right on Ethel from Highway 97/Harvey. 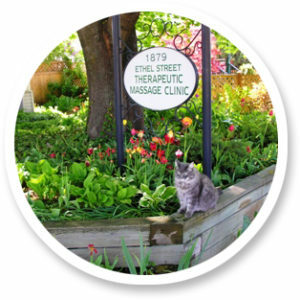 The clinic is 2.5 blocks down on your left, just before the light at Sutherland and Ethel. If you are coming from Rutland or East Kelowna, follow Springfield West until you get to Ethel Street. Turn right. The clinic is 2 blocks down on your right hand side. If you are coming from the airport area, follow Highway 97/Harvey West until you get to Ethel Street. Turn left. The clinic is 2.5 blocks down on your left, just before the light at Sutherland and Ethel.